Enjoy million dollar views of the ocean from this luxury villa just a few minutes from town. As you enter you are immediately greeted by the crystal blue ocean with almost an entire wall of doors opening onto the large covered terrace. The main floor has an open layout and soaring ceilings with a combined kitchen, dining and living area. The main floor also has a master bedroom with walk-in closet and large bath as well as a second bedroom and bath on the opposite side. Downstairs there is a 2nd master bedroom with walk-in closet and bath opening onto another terrace. There is also a maids quarters and laundry area. 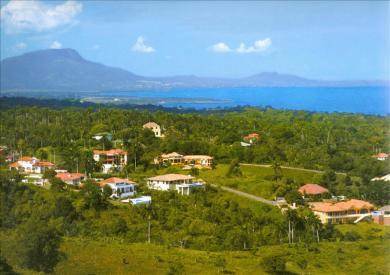 In a secure, gated community with ocean views from almost every room you will not find a better priced villa on the market today. Email Bob & Pat for more information.